Direct from Branson, the Ozark Jubilee features an all star cast of Branson’s top entertainers. 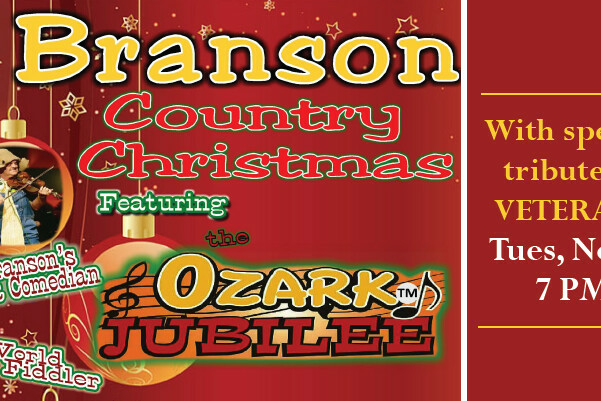 This year the Ozark Jubilee presents the BRANSON Classic Country Christmas. This dynamic show salutes the music of the great LEGENDS OF COUNTRY MUSIC in the first half of the show as well as a tribute to our VETERANS, thanking them for their SPECIAL SERVICE. The entire second half of the show is a variety of Christmas music. From traditional standards you’ll remember such as Silent Night, White Christmas and many more to some more contemporary Christmas selections. The Jubilee features Branson’s funniest comedian and world class fiddler DOOFUS DOOLITTLE! Doof will have you rolling in the aisles with his unique brand of humor, and you will be captivated by some of the best fiddle and world class violin music ever. Doofus has an all new line up of jokes and hilarious routines this year not to miss! Having performed with several of these artists, Doofus will be sharing stories from some of those legends. A real treat this year, Doofus will be saluting the great comedians of yesteryear. Folks such as Archie Campbell, String Bean, Minnie Pearl and many more of your favorites.